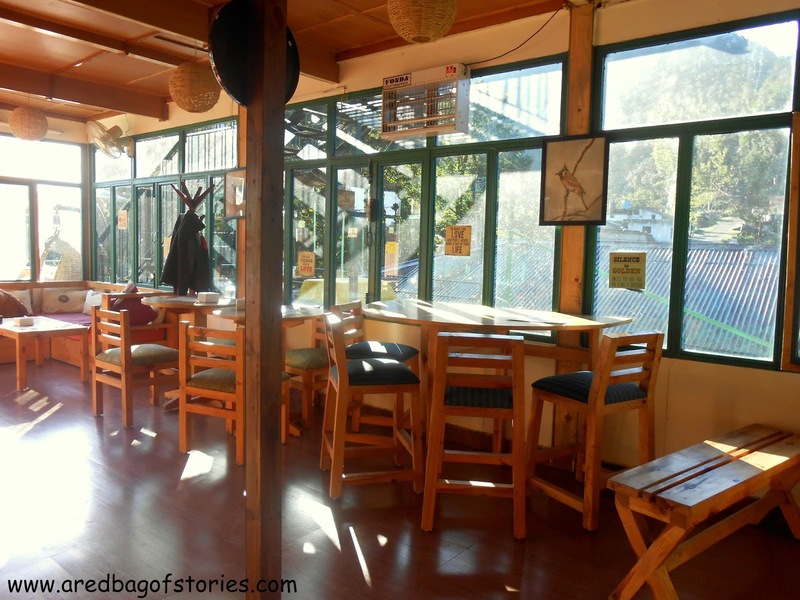 The stories and anecdotes that I chance upon, the places I stay at and all things that a solo female traveller finds on the way. 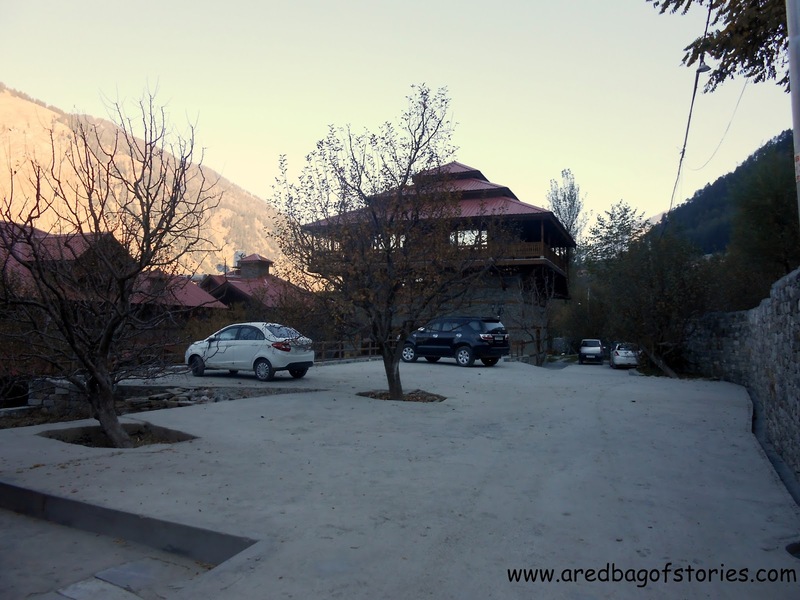 Manali holds a very special place in my heart for it was the first place I visited as a solo traveller, about two and a half years back. 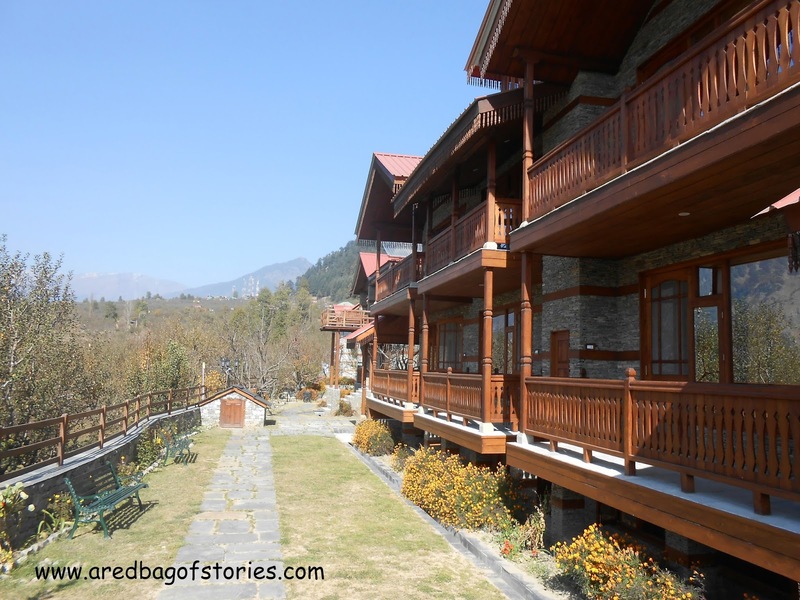 So when TCBG, travel group that I am a part of, asked informed the group that a handcrafted resort near Manali was looking at hosting some of us, you can understand my excitement. 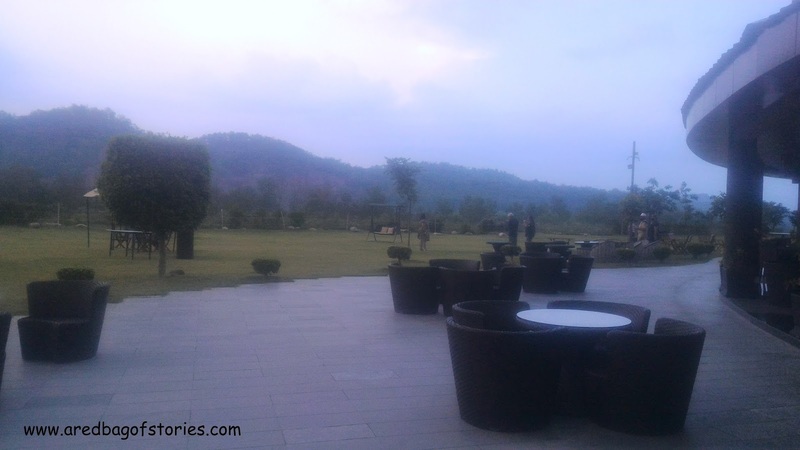 And so we, a group of five travel bloggers and photographers, reached ShivAdya Resort & Spa on a cold November morning. The first impression of the property was very warm and delightful. I couldn’t wait to get this trip started. While working in travel sector back in Delhi, this Himachali guy from Kullu carried his love for his home state. Planning Himachal Pradesh as tourist destination for his clients sitting in a Delhi office, Ritesh Sood yearned to go back to his roots. That day came after working in travel for 17 long and fruitful years. 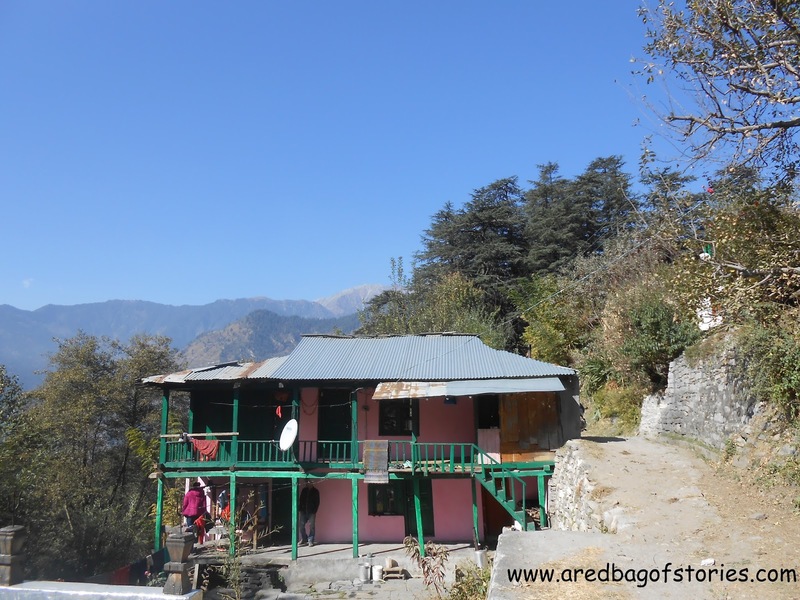 That experience not just prepared Ritesh to start something on his own but also solidified his vision to make Himachal Pradesh as THE destination when people think of a mountain holiday. 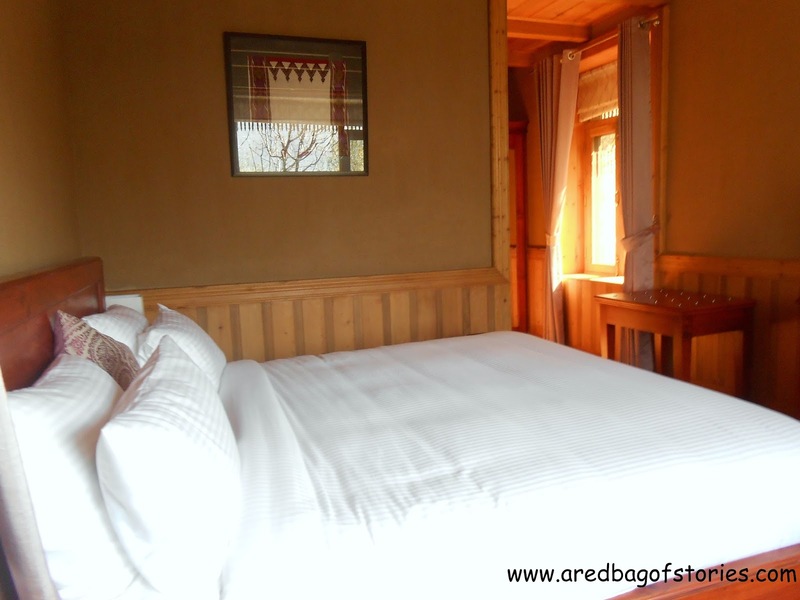 Moving back to Manali with his family, he looked around and studied the hotels and accommodation options in and around Manali and found all of them lacking in one thing. A character. 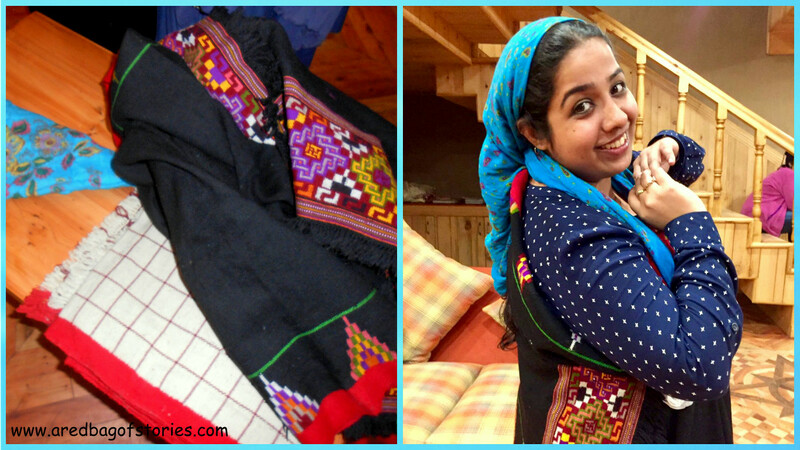 He decided to create something that gives utmost comfort to the visitors but also stays true to Himachali heritage. 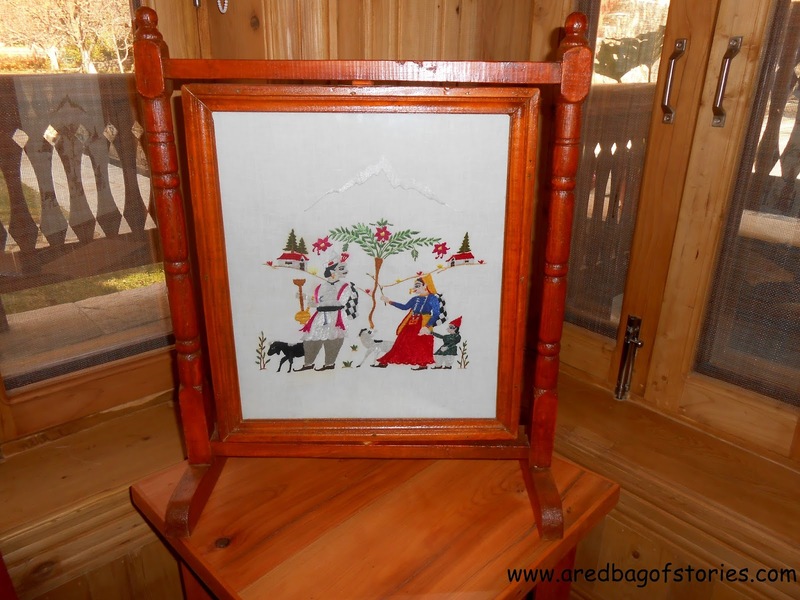 And so began the planning and creating a handcrafted masterpiece that is both an example of Himachali ethos as well a man’s passion to give it back to his hometown. A hard labour of two and half years led to ShivAdya. By the way, Shiv and Adya are Ritesh and Neelam’s kids and they combined the two names to name another of their love, ShivAdya Resort & Spa. There are just 15 rooms but boy, you will appreciate the attention to detail in all of them. 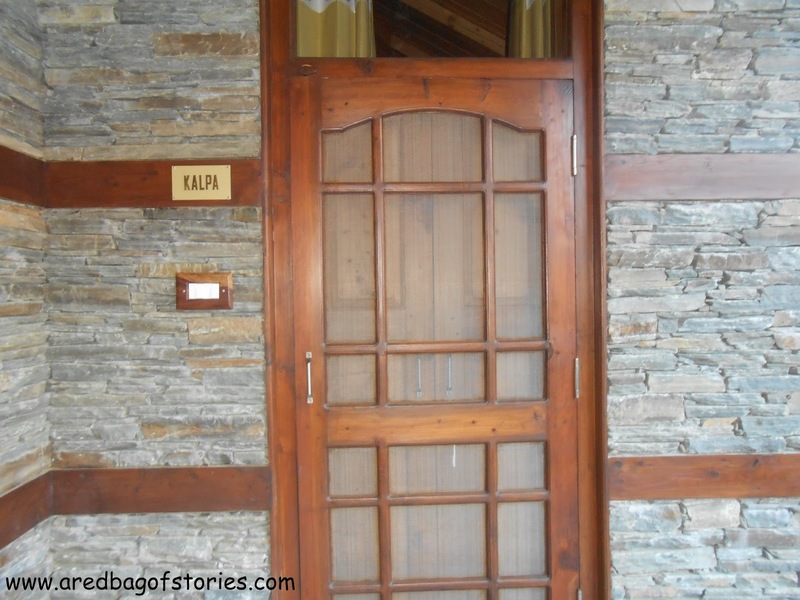 Naming all the rooms after valleys, passes and mountain ranges of Himachal like Kaza, Kalpa, Zanskar, Hamta to name a few. Ritesh’s passion behind the property and idea will instantly rub off on you. And you would want to sit with him and listen to his story! Yes, you have to see it to believe it. The flooring, the ceiling, the outer walls, everything has been made by hands. 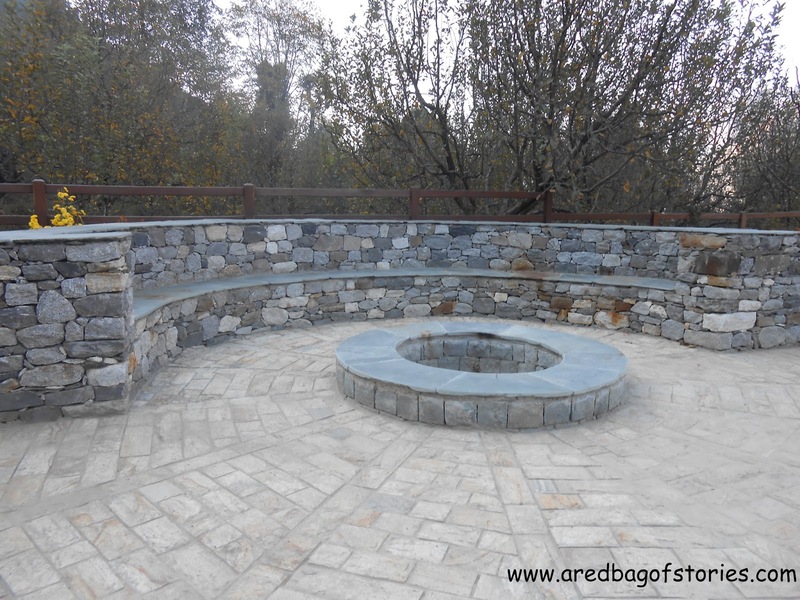 The design has been inspired from the local architecture of Kullu, Kangra, Mandi and Kinnaur valleys. 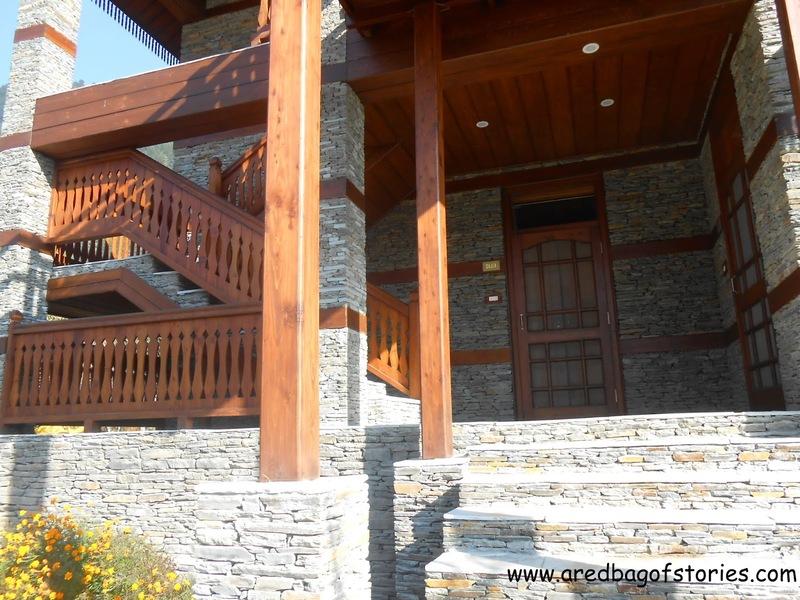 The whole property has been constructed using mud, wood and stone and almost no paint work. 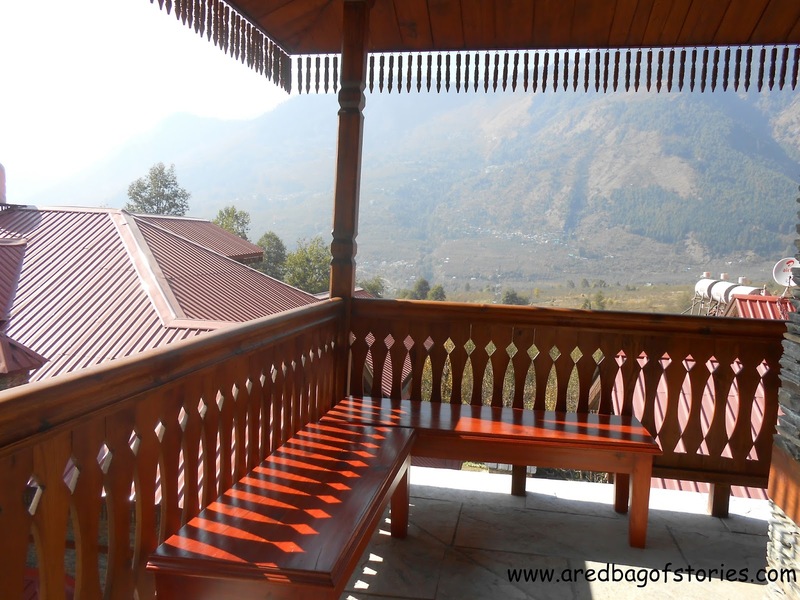 All the wood that you would see in the rooms has been locally sourced, from walnut, fir or sheesham. And only preservant has been used on the wood to help retain its original properties. No extra wood finish. The resort is eco-friendly and all the material left over after construction was used for land filling. So, when they say it’s handcrafted, it is. No kidding. No, that doesn’t mean you cook yourself or you go hungry. 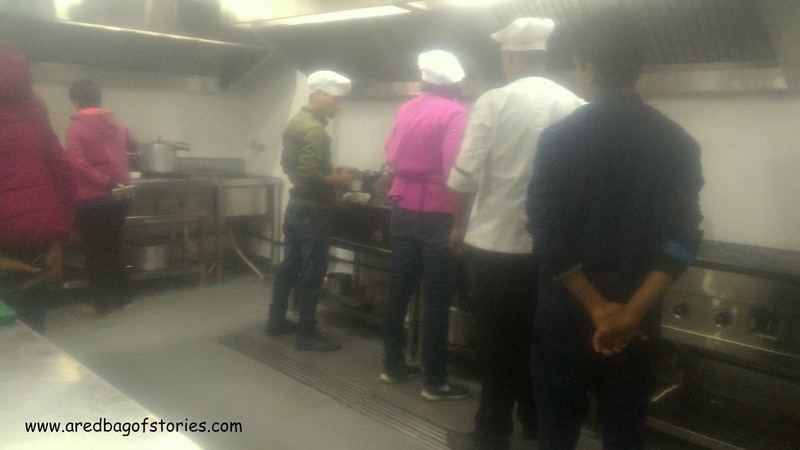 They have a wonderful chef and very talented team of sous chefs who will discuss with you about your tastes, preferences and whip up every meal as a special, customized for you meal. The food is lip-smacking and simple. What drives it again, is the passion to keep alive the local flavors and ingredients. Needless to add that I over-ate all the meals, shamelessly. 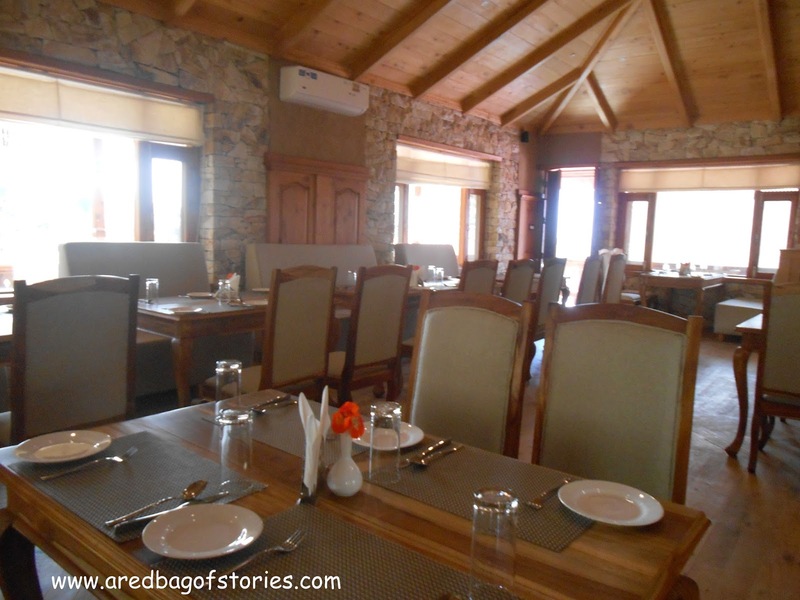 You will notice the artwork in the lounge or in the rooms and it is nothing but an ode to Himachal. Kullu rumaal (handkerchief), which has Lord Krishna knitted and it looks the same from both the sides of cloth, adorns many a walls and side tables in the property. 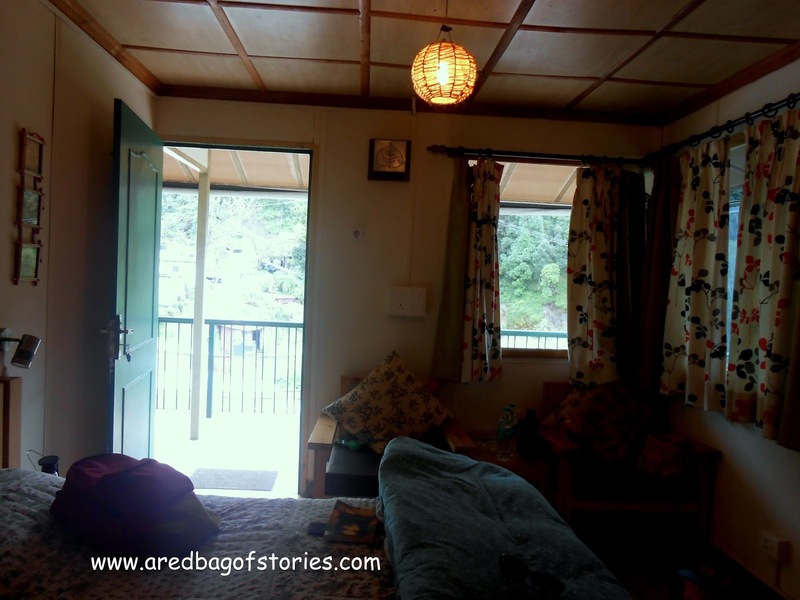 There are wall hangings of pattu (local fabric) that lend a very distinct character to the interiors of the rooms. 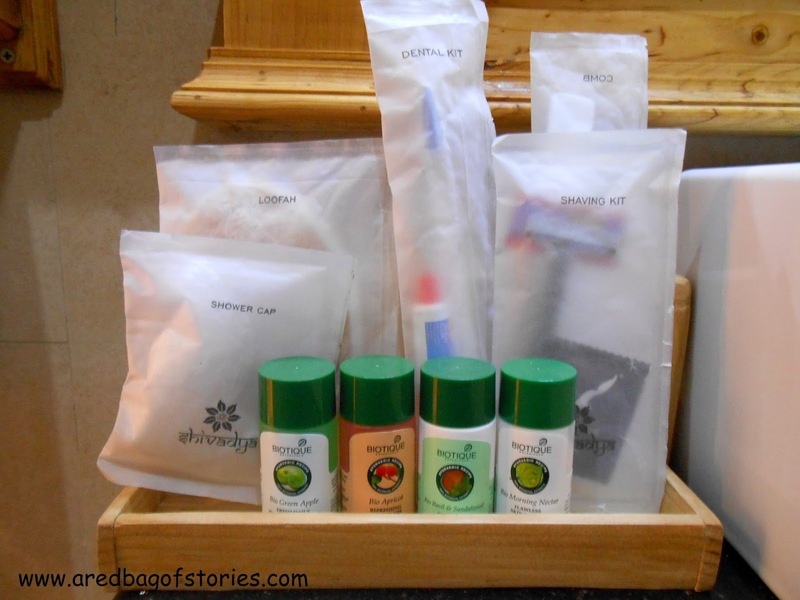 On the other hand, you will find every modern amenity to keep your stay comfortable. 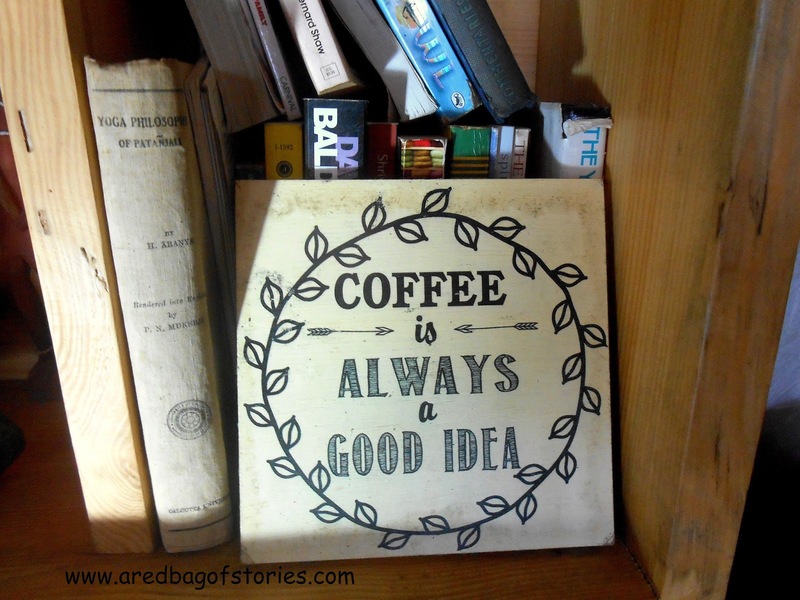 Like the beautifully arranged toiletries in the bathroom or the cookie platter on the coffee table. 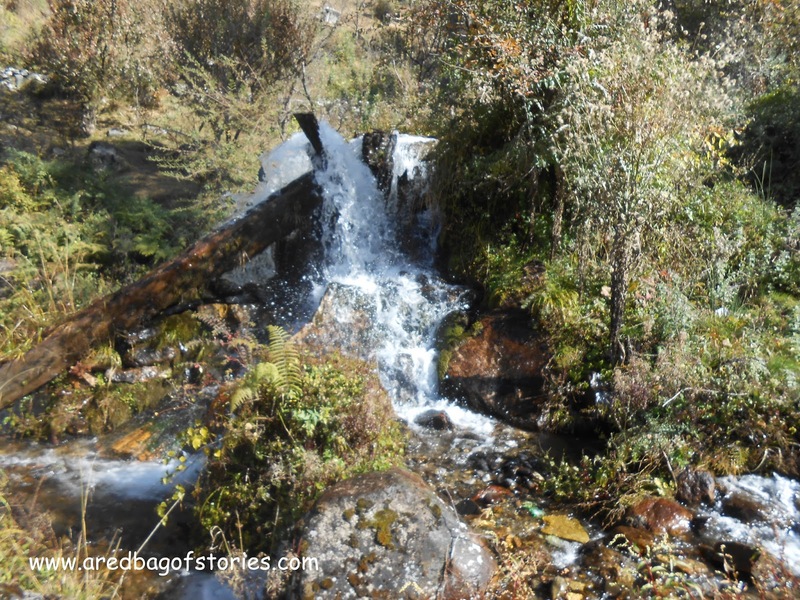 Now, doing the Mall Road is not just Manali or Himachal. 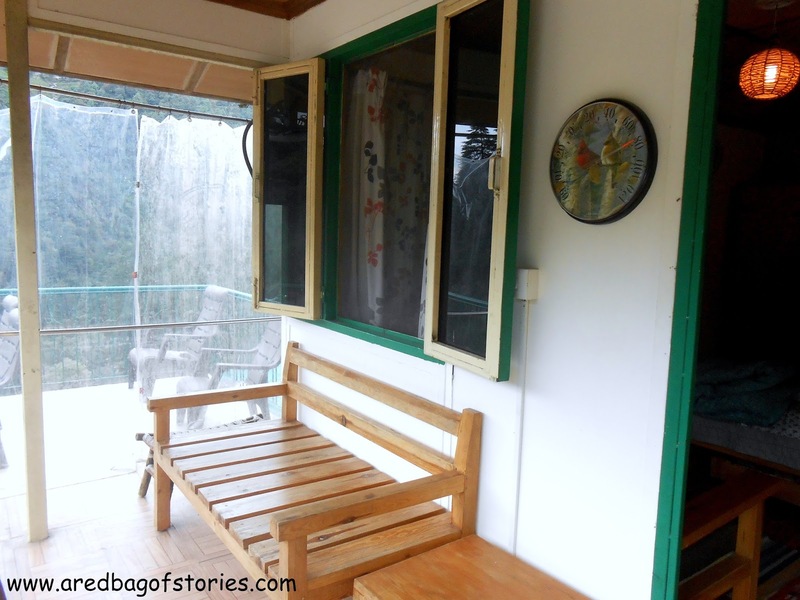 When you are staying at a place like ShivAdya, you must experience Himachal like a local. Go for a walk in the nearby Karjan village.Walk through the village, surrounded by thick Devdar trees and rice fields. Or, go for a hike around the Karjan waterfall. Take a pattu tying session with local ladies helping you drape the thick, woolen dress. Pattu is often worn on special occasions like a wedding. Dress up like a pahadan and click some pictures for memories and photo album. Walk up to the beautiful apple orchard and soak in the sun, while the chef whips up delicious lunch for you. 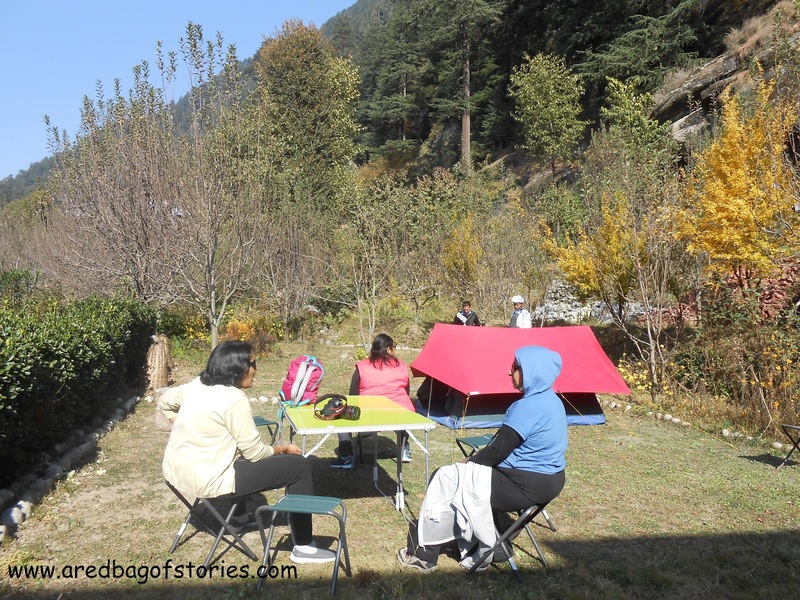 A picnic lunch in the nature would be nothing like a lunch in an air-conditioned café. 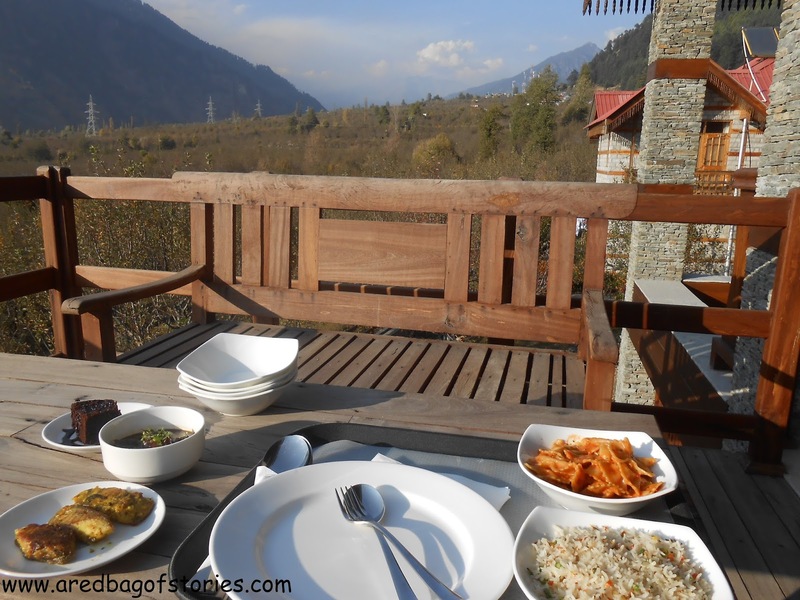 If you love food, cooking and eating both, then take the cooking class specializing in Himachali cuisine. 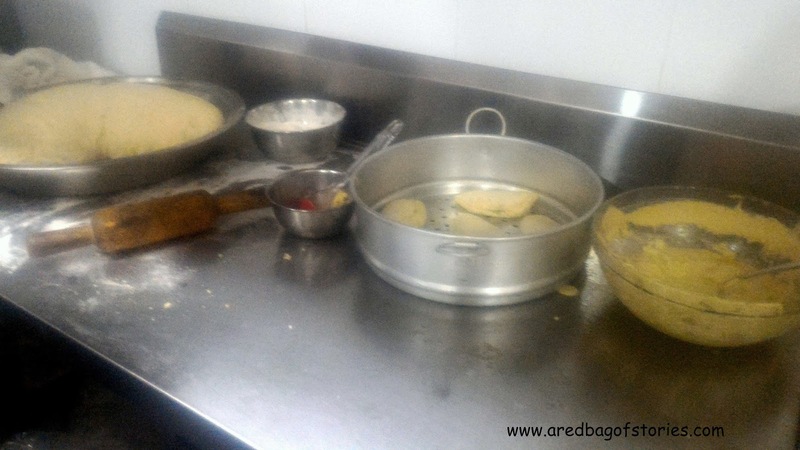 Learn to make local delicacies from local women and Ritesh’s wife, Neelam, who is a brilliant cook. I can still think of that delicious meal whipping up in the kitchen. There is no end to the activities you can indulge in or experiences you can have at ShivAdya. They have a very exhaustive list of experiences to choose from. You just need to decide what’s your heart is up to in that vacation. Spa, bonfire, trout fishing, mountain biking. Literally, whatever your heart desires. Now, some facts before I sign-off. 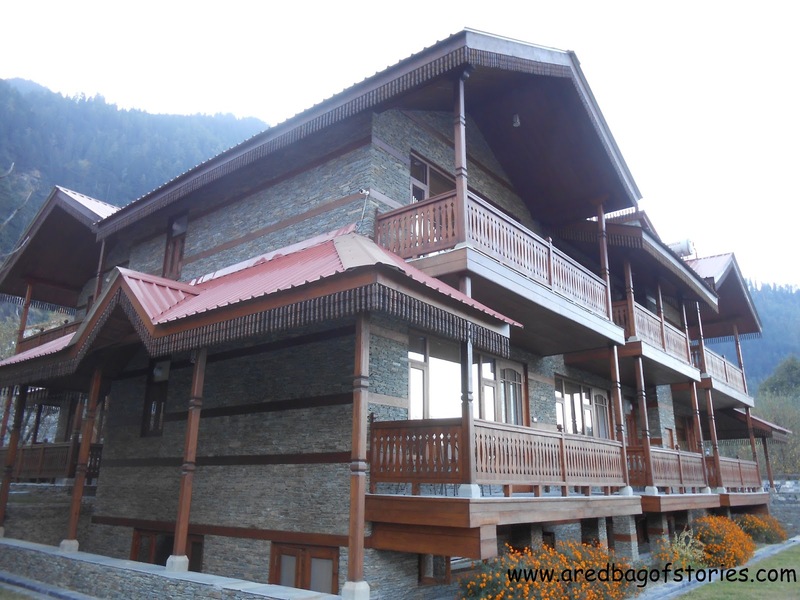 • ShivAdya is on the Manali Naggar Road, about 12 kilometers from Manali city center. • You can reach by an overnight Volvo from Delhi, take a train till Chandigarh or a flight till Kullu. • Do not forget to have a long chat with Ritesh and Neelam. 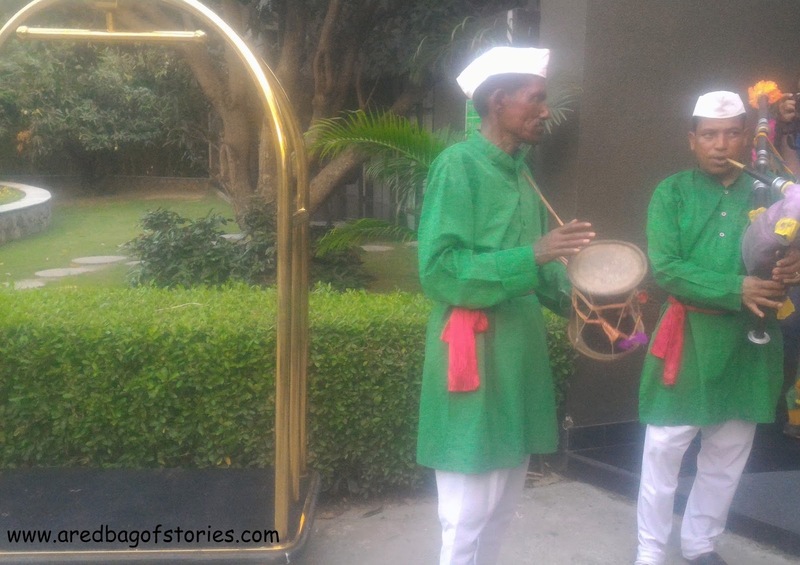 Their love and passion for the place might inspire to go for your own dream too. Liked it? Didn't? Say it all here. I am all ears. 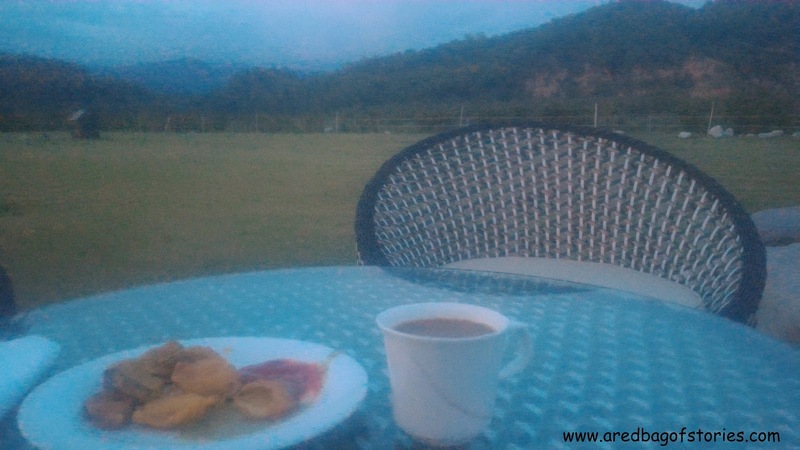 It was the birthday weekend and we wanted to check out some place closer to Dehradun for two days. 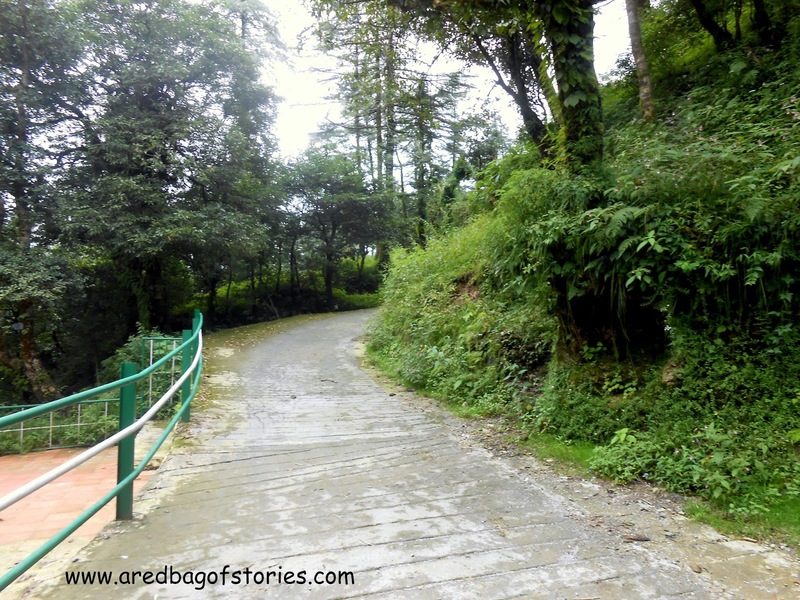 Mussoorie was the very obvious choice undoubtedly. 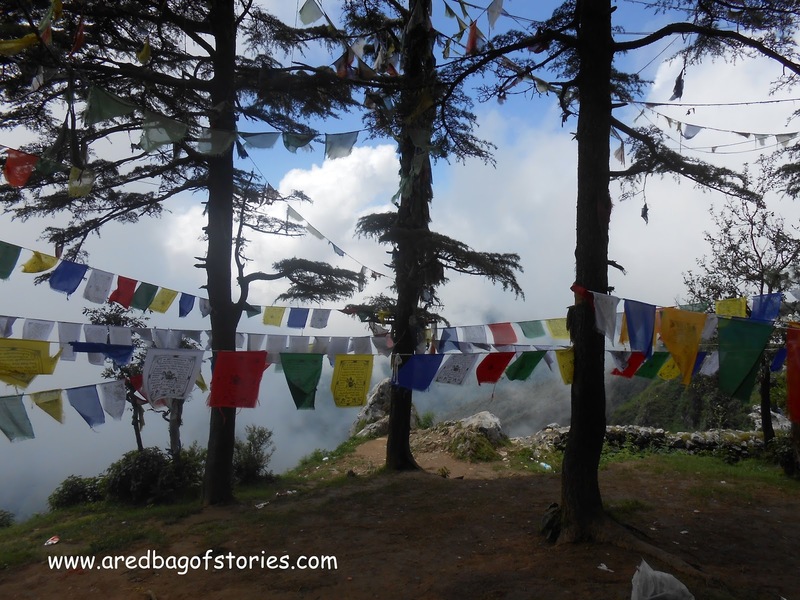 I have never been to Mussoorie and frankly speaking, it wasn’t something on my list either. 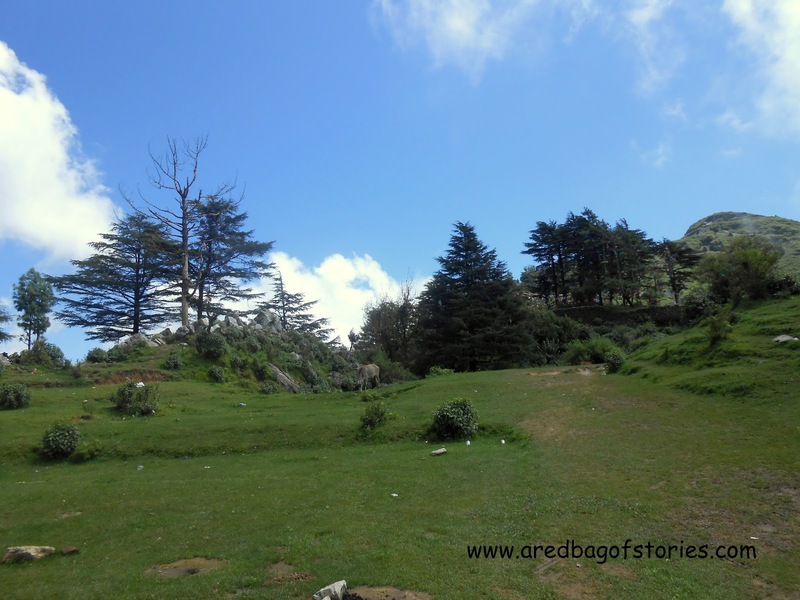 Simply because of the over-crowded and over-commercialized state of affairs in this once all-green and beloved hill station. In the search to not settle for anything crowded, came another option - Hathipaon. And what settled the deal for Hathipaon? 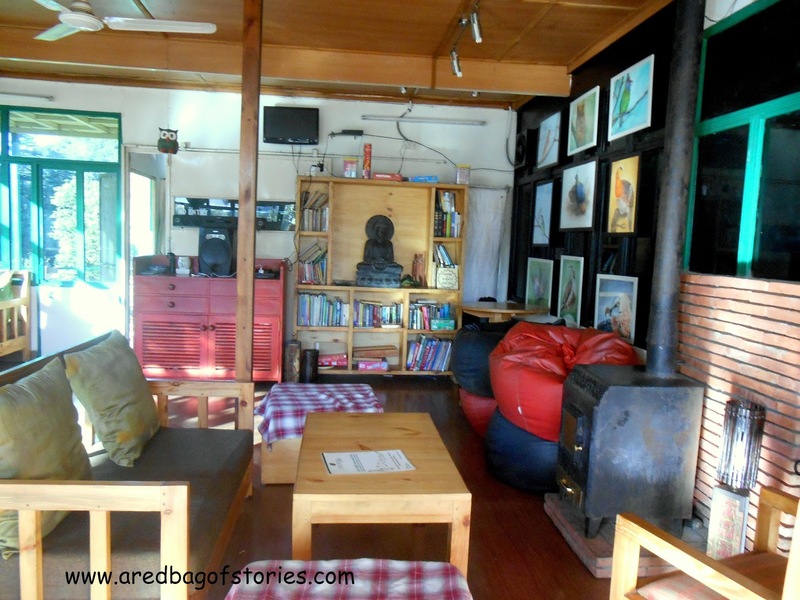 A beautiful, warm homestay with the name Seegreen Lodge. It checked all the boxes on our list. 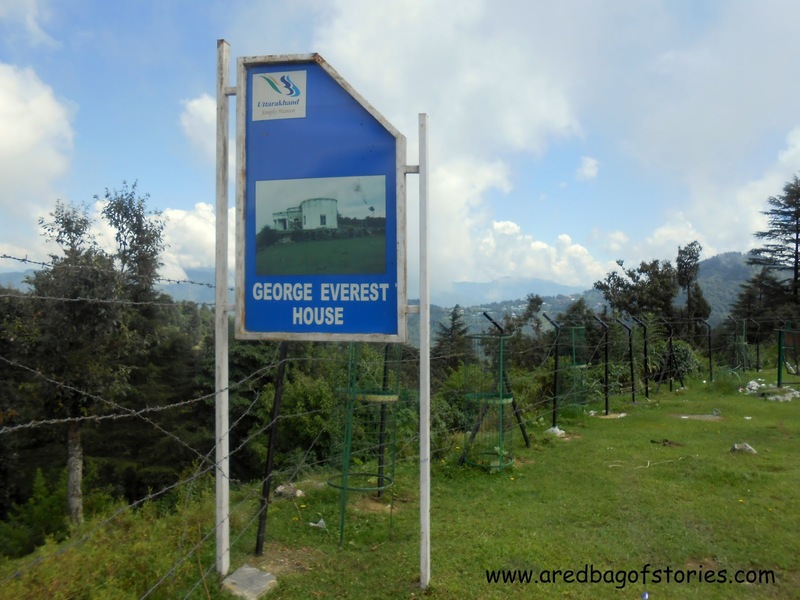 Perfectly located, 35 kms from Dehradun and about 4 kms from Mall Road of Mussoorie. Close to the action and yet sitting cozy at a distance. 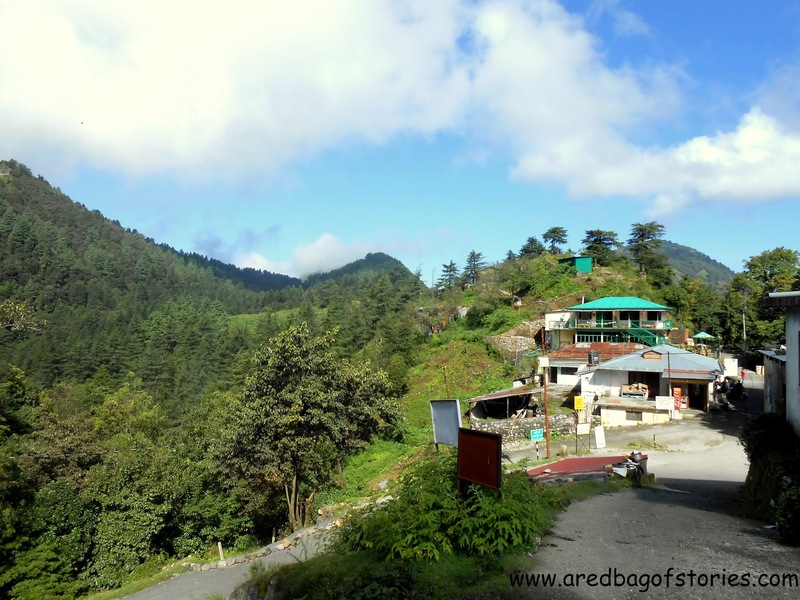 Easily accessible with cabs from Dehradun and even from Mussoorie. We reached Seegreen around noon and immediately felt at home with the quiet and blissful location of the place and a very warm and inviting aura to it. 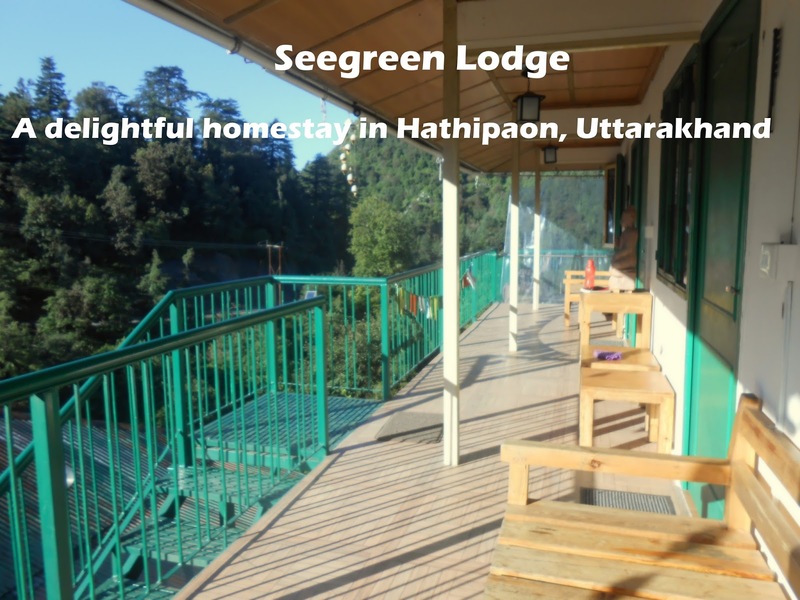 Just three rooms with one spacious dining area and a very comfortable balcony with a sitting deck, Seegreen is every bit of a homestay you would want to lounge around on a long weekend. 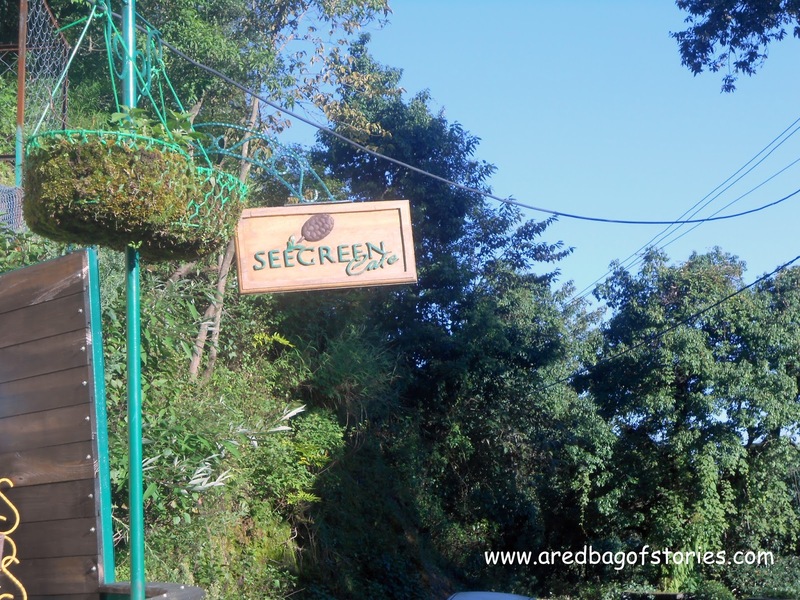 Started by a Mumbai-based couple for their sheer love for owning a little space in the mighty mountains, Seegreen is run by two of their very efficient Pahadi lieutenants. The whole space is artfully done and attention to little details is unmistakable. Rooms are designed for comfort and complete with all the amenities. The views from the big windows show you the pahadi houses in the distance, people going about their lives, while an occasional vehicle or two pass by on their way to or from Mussoorie. I woke up early morning, went for a walk around the lodge, a little uphill, striking a conversation with this aunty who runs a small tea shop a little ahead the road. Post the walk, I got back and found my corner in the balcony, and decided to vegetate there for some hours. To aide my efforts, I ordered a hot, soothing cup of honey-ginger-lemon tea. 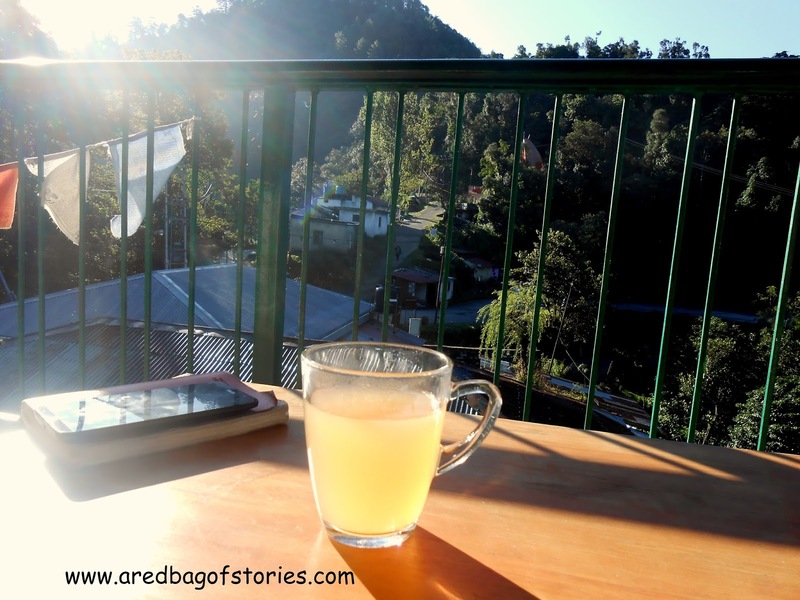 I can’t express that in words just how delicious that glass mug full of hot, golden liquid felt on that pahadi morning. 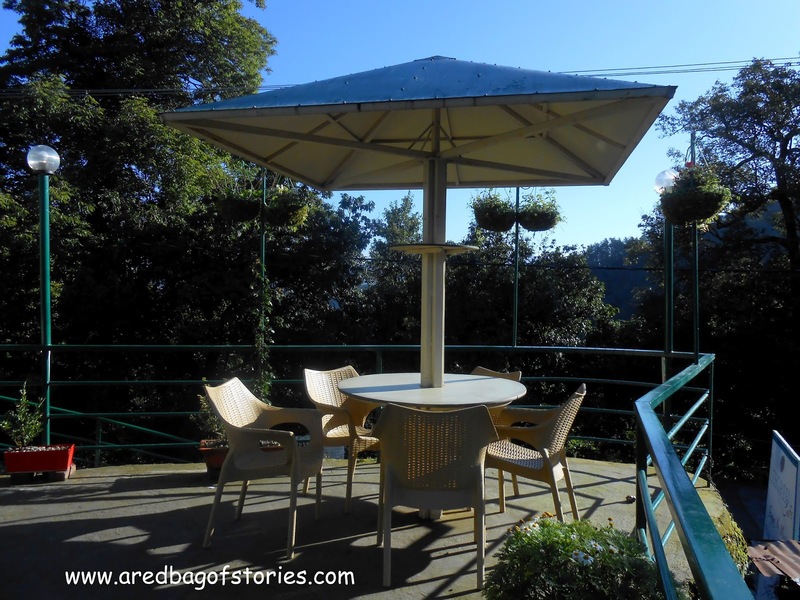 You can settle in the balcony to the humbling view of the criss-cross hill road, with pahadi houses strewn in between. 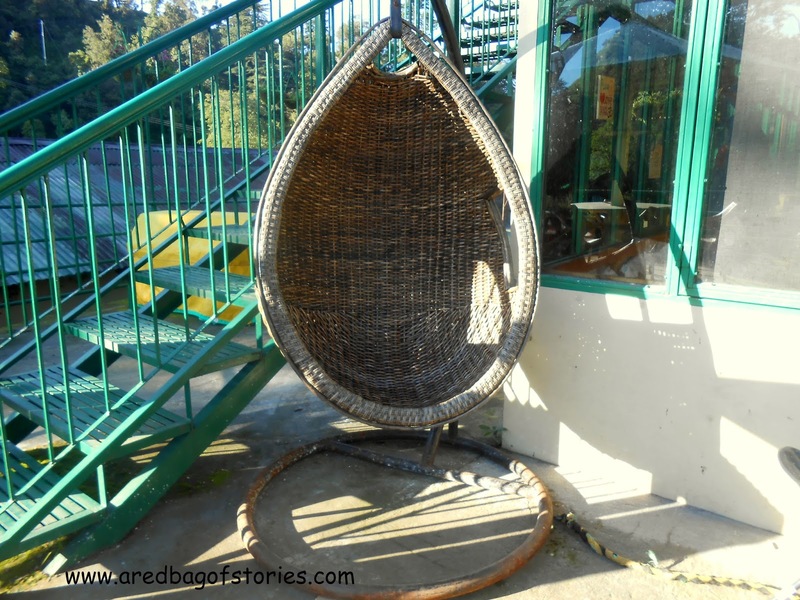 There is also an extremely comfortable cane swing in the porch to go, settle in to with a book in hand. The objective of staying here should solely be to not have an agenda. You will make the most of the place and your holiday if you just lie back, feet up, with a book and enjoying your cup of tea or coffee. Did I fill you in on how awesome the food is at their café? 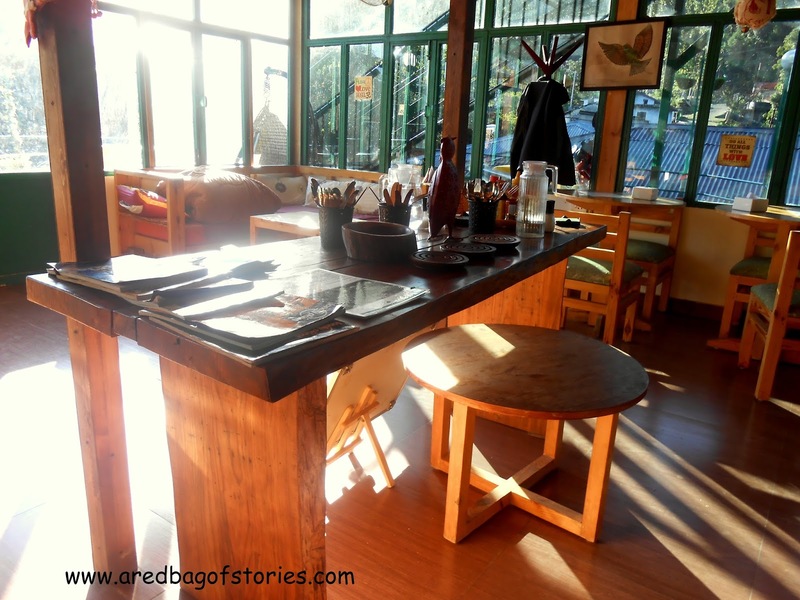 The food is from their farm, grown organically and prepared fresh as and when you order. Be it the delicious creamy mac and cheese, warm waffles with chocolate sauce, scrumptious paranthas or the tall glass of chilled lemon iced tea, every item on the menu hit the right chords. 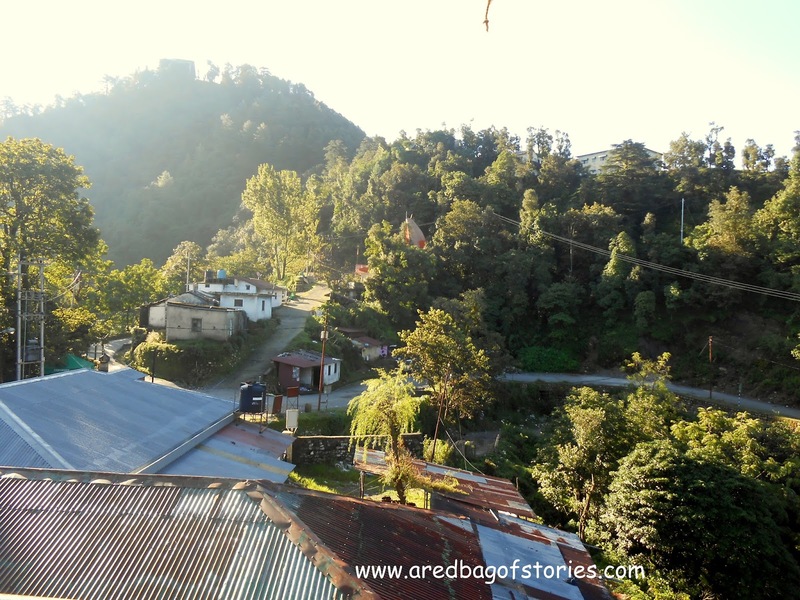 The place is a homestay so make sure you don’t go around with expectations of a five star hotel. 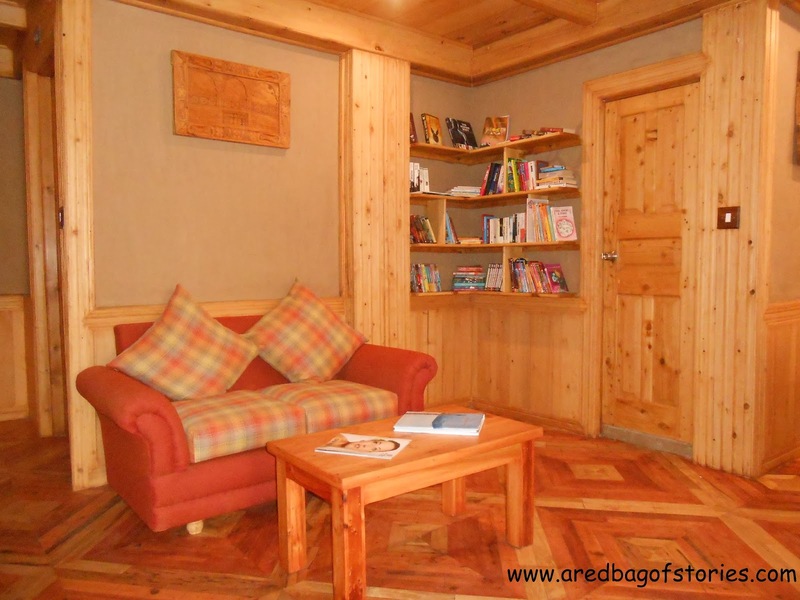 You will be bowled over by the homely touch, warmth and personalized service of this lovely place, staying true to the idea of a homestay. 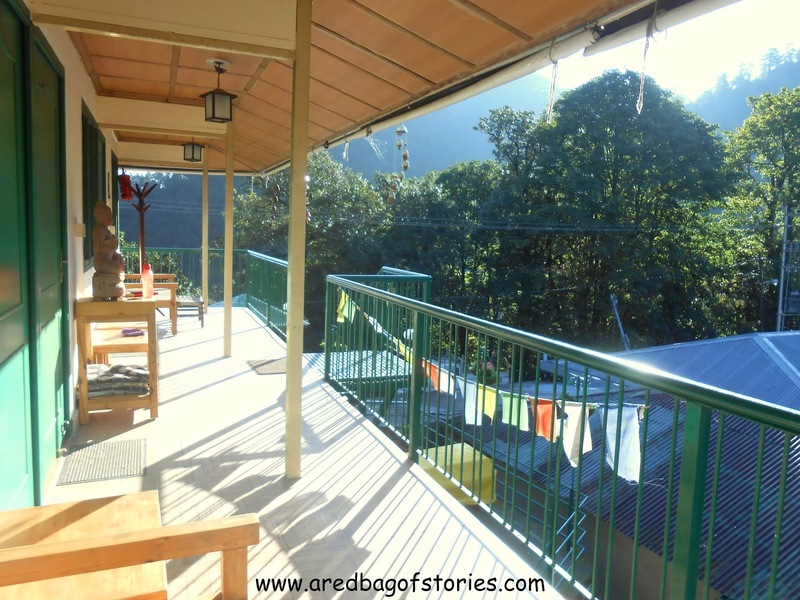 Do check out this delightful place for your next long weekend when you want to break away from the big cities and work emails, up and away in the world of wilderness and nature. 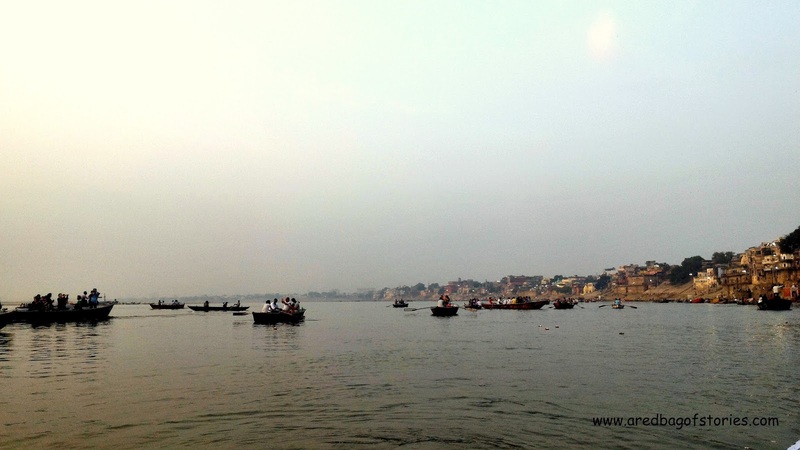 It is quite an irony that one goes to Varanasi or Banaras to look for peace when the city is anything but that. 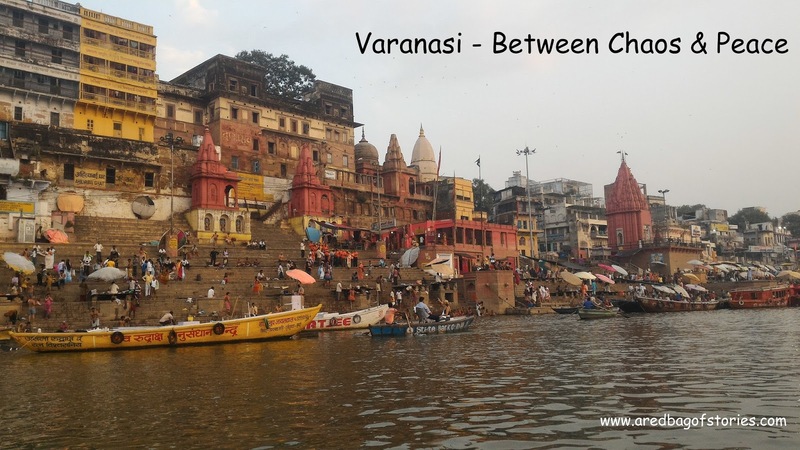 The narrow bylanes, the busy ghats, the quest to find an original Banarasi saree, the coexistence of chaat and cafes, the boat ride on a calm Ganges early morning and most importantly, the celebration of life and death, everything that Varanasi is, it is anything but calm and yet, there is an odd sense of belonging that one feels there amidst it all. A typical day for a visitor starts well before the dawn breaks. 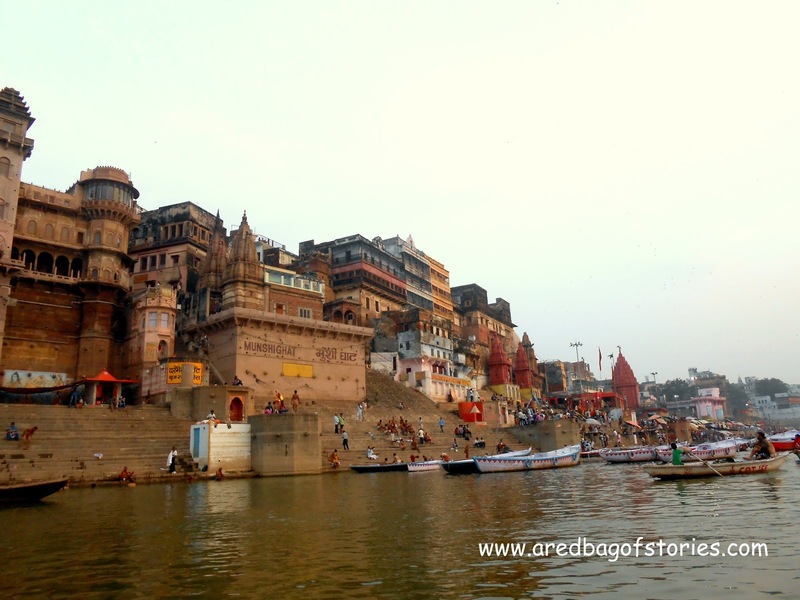 As you wade your way through the city roads and streets to reach the ghat to board a boat, you look around. Even in deep sleep, the city has a distinct vibe. There are newspaper vendors sorting the stacks on the corner of the streets, there are chai stalls setting up their shops to feed the city, there are a couple of autos and taxis crossing you by, with more tourists who have just arrived in the city and then there are cows and dogs to keep you company on the walk to the boat. 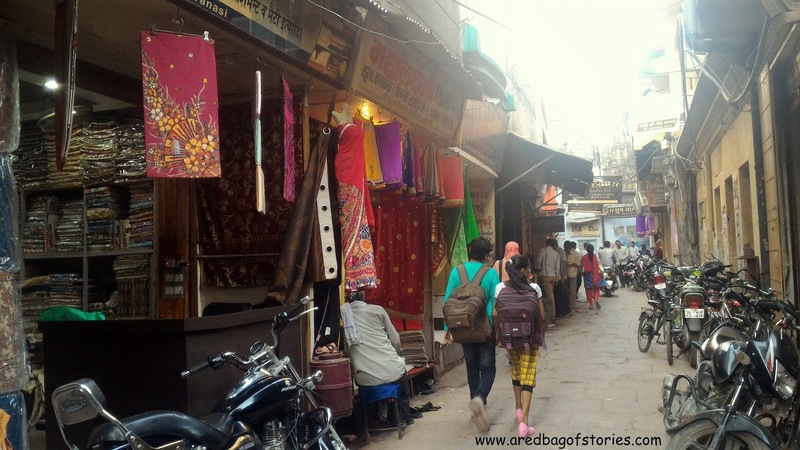 Through the day, there are crowded markets like Thatheri Bazar, Godoulia, Chowk and Dashashwamedh Gali with shops of Banarasi sarees,old and popular sweet shops, the quintessential lassi and Banarasi paan stalls, fancy cafes and temples. Once inside these bazaars, you will hardly be alone. There is not a moment of silence and yet you find quietude by soaking your eyes to this treat of colors and smells unfolding in front of you on every bend of the road. The evening Ganga aarti brings with it another color of the city. For the first-time visitor, you must take a good (preferably front) seat in one of the many boats parked on the banks of the river to see this grand spectacle. In perfectly synchronized movements by the seven priests, the aarti is nothing short of a theatrical performance witnessed by a sea of crowd. There will be hymns, the music, the chants, the flash of many cameras and you will find your own sweet spot, your comfort zone when you will be a part of that whole scene, that performance like a protagonist and yet, you will view it from afar and alone. And the biggest, most striking contrast in the city fabric is that life and death coexist in a harmony. 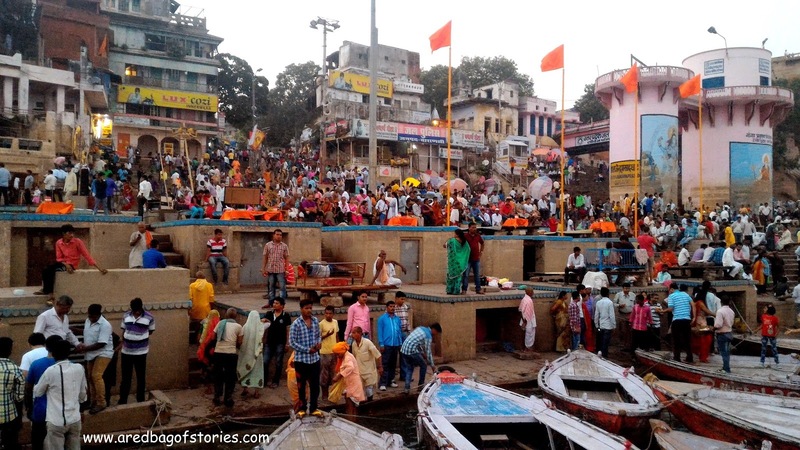 On your way to the ghats, or through the narrow lanes, or while on the the boat in the Ganga, you cannot miss the dead bodies being carried towards the Manikarna Ghat, also known as the burning ghat. For that moment you cannot help but take notice of how this city has the start and an end to the life and all that exists between. That feeling leaves you humbled. 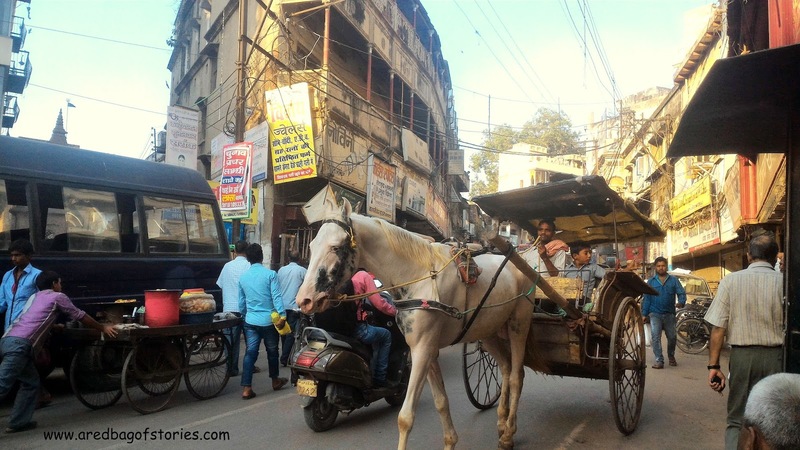 Amidst all its chaos and madness, new and old, traditions and modernity, ghats and bazaars, there is no denying Varanasi will give you your ‘aha’ moment. Been there? What was your moment? Now if you came here wanting to read a juicy Delhi vs Mumbai piece, I am sorry to break it to you that this isn’t one of those. No, sir. In fact, let it be known once and for all that I absolutely love Mumbai. 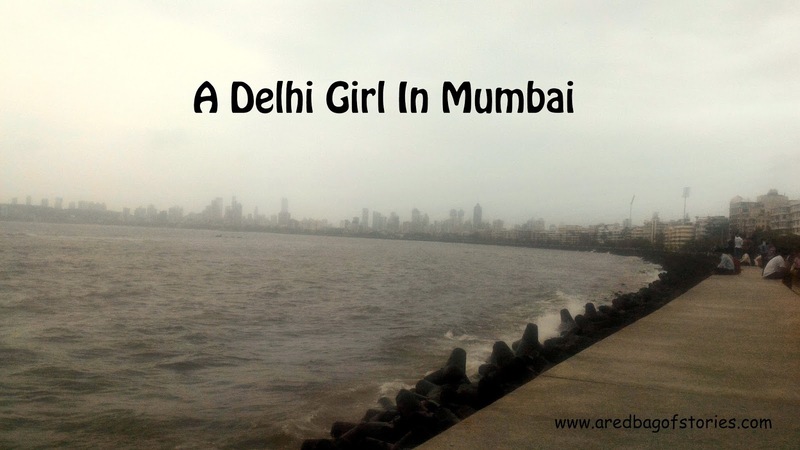 Yes, I am from Delhi and my heart beats for Delhi but my love for Mumbai is growing too. I have been visiting Mumbai for some years now but let me tell you that visiting and staying in a city are two different things. I always liked coming here and wanted to stay and work here for a bit. And I am not complaining. Now having been here for some months now, here’s how Mumbai looks to me, a Delhi girl. Usually said with nodding the head, in an affirmative, as a reply to anything that warrants you to say an ‘okay’ or ‘fine’. I asked a friend, ‘agar nahi chala to?’ and he said ‘to chalana padega’. So my dear, chalega tumko?? 2. Samosa pav, you underdog! Because big brother ‘vada pav’ is the unquestioned, reigning king of Mumbai street food! But one bite of samosa-pav, and I knew I had found my carby-soulmate. Samosa? Yum. Pav? Say aye to the carb overdose. Chutney? Add some more! People, please tell me what’s not to like in this little bundle of joy?! As much as your tongue twirls and twists saying these words, believe me they become a part of your life sooner than you realize. True story. And yes, water tank is called ‘taanki’. I think it’s quite cute. 4. Rickshaw ride at night, anyone? Back in Delhi, last I would take an auto is around 10pm. After that it’s always cab. Look around the metro stations at night and that last mile distance to home seems a lot unsafe than travelling around the whole of Delhi. But here? Last I have taken an auto (or rickshaw) is at 4am. And not even once felt uncomfortable doing it. And that’s big for me. 5. Hello, why isn’t anyone staring at me??!! Yes people, yes. Get over yourself. Nobody got time here to give you those long, judgmental glances, neither in trains nor on roads. The thing is you will realize the whole city is working against the clock, from running after locals to beating the traffic. There just is no time to look around and pass a comment. Believe me, it was so refreshing! And this can give a serious run to your heart beat. You just pray for clear roads and no signals. Well, almost. I reached Mumbai in March and I am not sure how to put it, but heat of Mumbai was so much different and surprisingly unbearable. But everyone had a consistent reply. ‘Oh, just wait for the monsoons’. 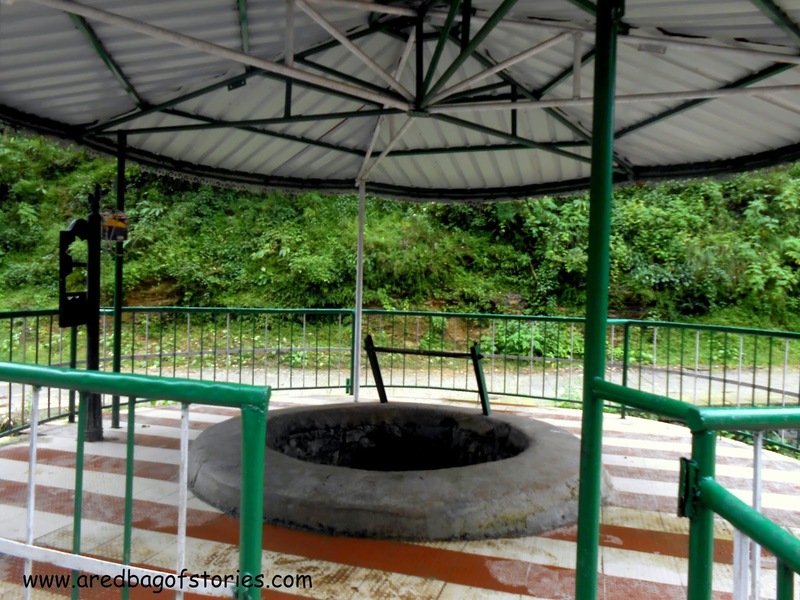 When they taught us that Cherrapunji gets the most rainfall in India, I think they need to revisit it. Because here in Mumbai, it just never stops raining. And excuse me, there is no concept of drizzle. It just starts raining and then it’s pouring! And it pours all day long. 9. Nothing stops because it's raining. NOTHING! I remember I had to go on a date and I asked my Mumbai friend on should I change what I had planned to wear because it was raining. And she said, ‘no bro, rain is gonna be here. Don’t change your plans.’ Noted. Dates, interviews, random visits to town. Nothing stops here. You cannot survive a day in the Mumbai rains with your suede shoes and kolhapuri chappals. I have never been so thankful to my faithful pair of Crocs. I have always had that freedom when it comes to family. But there was always some holding back when it came to Delhi. Mumbai gives that freedom, that space to grow and explore life which is just very liberating. 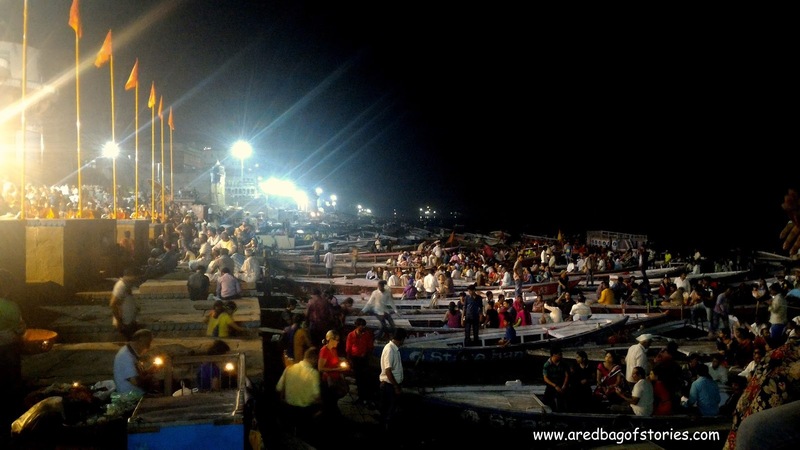 Everyone has their favorite – Marine Drive, Bandstand, Worli Seaface. My go-to spot is Marine Drive and sit there and think about what all is wrong with my life (not kidding). I love how sea is everyone’s go-to spot here. You cannot just miss it. 13. Oh my coin purse is overflowing! Auto driver goes by the meter and returns the loose change. Thank you sir! 14. Please follow the queue, ma’am. Yes, ok.
Auto, bus, train ticket, there is a queue for everything and boy, people respect it here. Back in Janpath, asking for anything my size has always been a trip to embarrassmentville. ‘Aapka size nahi milega’ is what I am used to hearing. ‘Haan madam, aapka size hai na’. That’s Colaba Causeway for you, my Delhi wale, plus-sized friends. And proud I shopped. 16. A city that never sleeps. First-hand experience. And yes, at any point of time, there are people eating out or chilling by the sea or on a drive or selling chai. The day seamlessly makes way for the night and nothing changes on the roads of Mumbai. Did I get those right, Mumbai people? The lovable first impressions? Do tell me! It is not every day that you want to take a break from job, heartbreak, city, people and a well-curated trip lands in your lap. Well, I can say I was lucky that it happened with me. 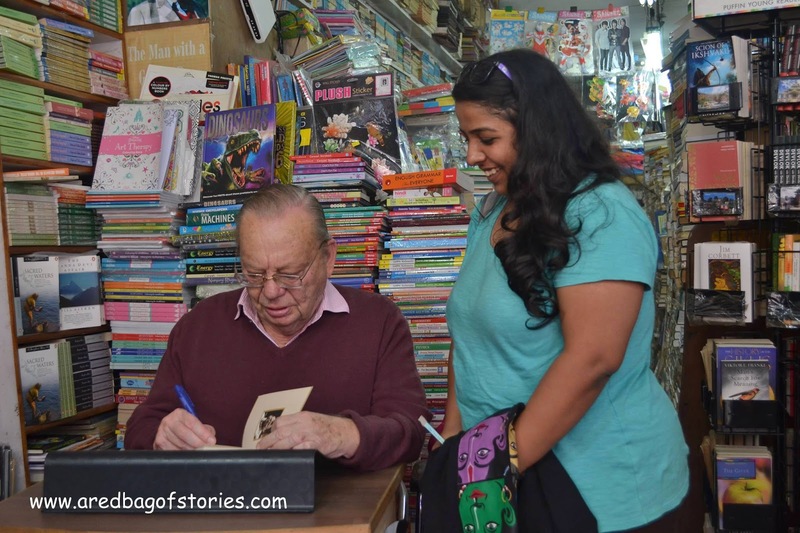 I was in the middle of wrapping up this job in Mumbai, packing my bags to visit family in Delhi and had already been contemplating rescheduling my return ticket as I had no job to come back to. In between all this madness, Akanksha - a dear friend, a fellow traveller and a very popular blogger- called me to check if I would be interested in going to a resort near Jim Corbett for three nights and four days as part of a yoga retreat that the property was planning with a bunch of bloggers, at the backdrop of International Yoga Day. Now if you know me, you know I would have been sold at the mere mention of ‘yoga retreat’. A couple of mails and detailed itinerary later, I was already looking forward to this awesome Delhi trip that had planned itself so amazingly. 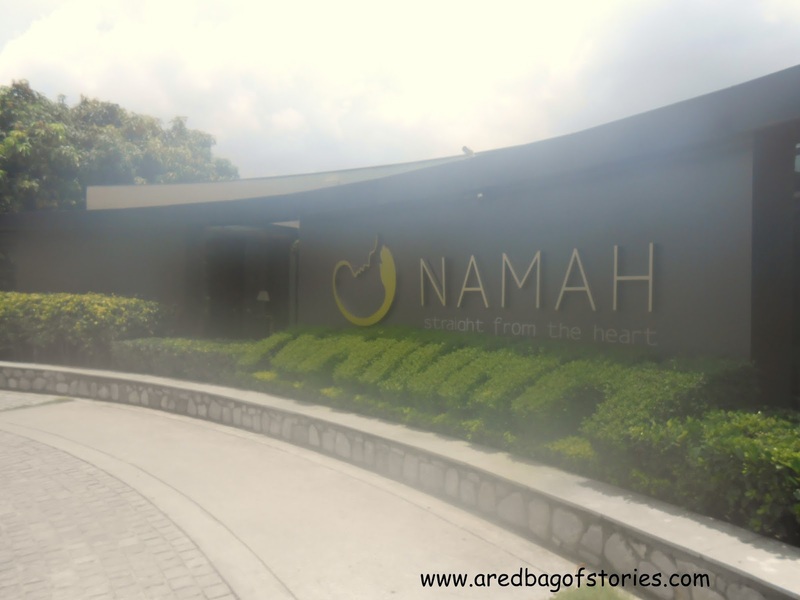 Reaching Delhi, I was already packing another bag to start for Namah Resort. 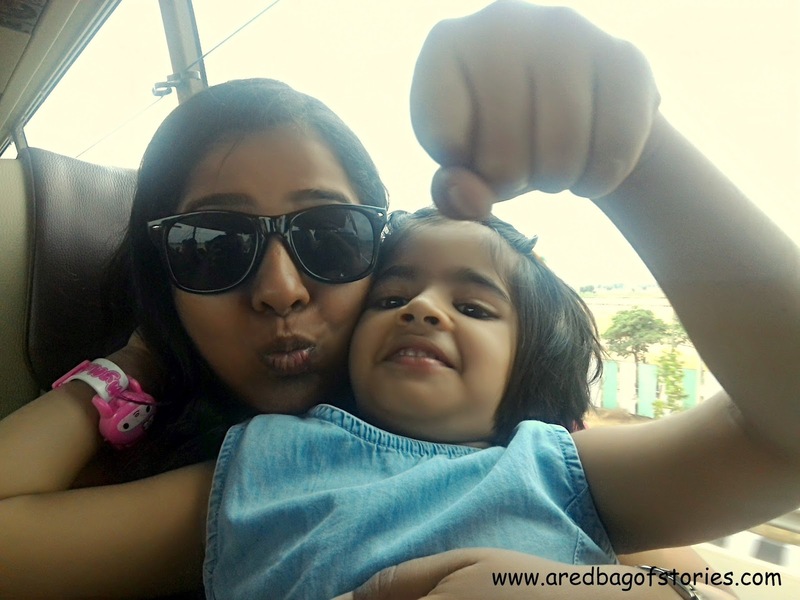 And I was also looking forward to this trip because I was meeting another dear friend, an army wife, an avid traveller and a published author, Aditi Mathur Kumar who was also bringing her adorable daughter, Gauri (Chikoo to the world and Cheeka to me). 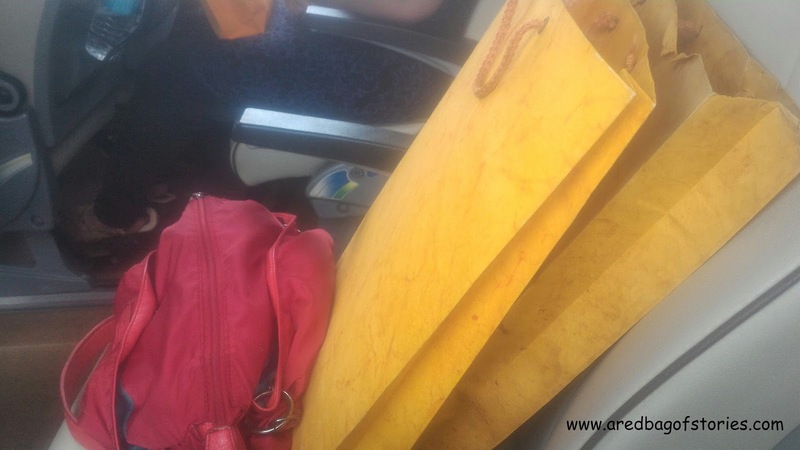 Especially when you enter the bus and find a very thoughtful goodie bag on your seat. Sorry, you do know I am biased towards food. And it had Pringles that gave us company all through the way! And then Cheeka and I had our moments of goofing around. 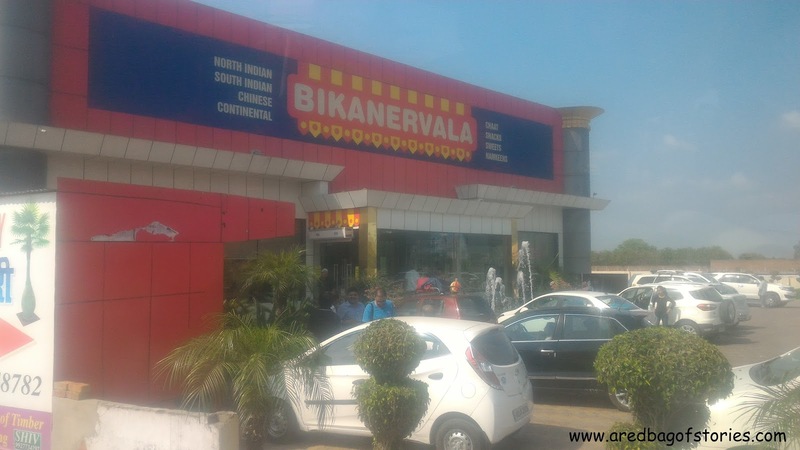 And the mandatory highway lunch stop at Gajraula. After half a day long journey, Namah welcomed us with some real royal welcome. 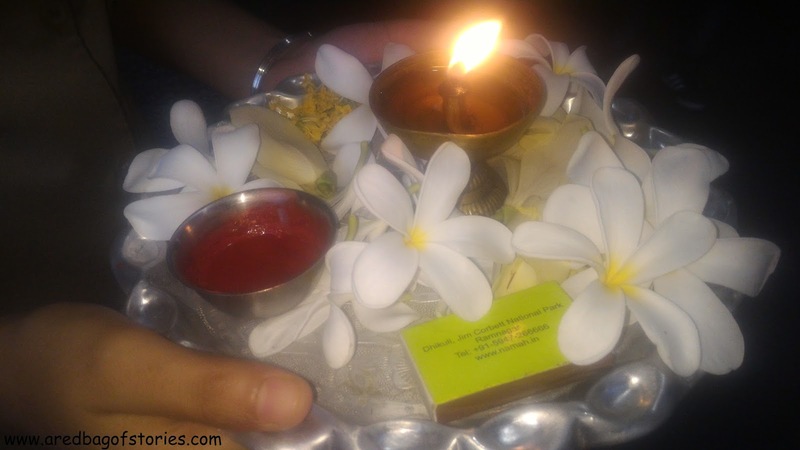 The beautiful, decorated thali, the tilak, pahaadi music being played and the refreshing welcome drink of rhododendron flowers. All this while our eyes were taking in the sweeping landscapes of this charming property. 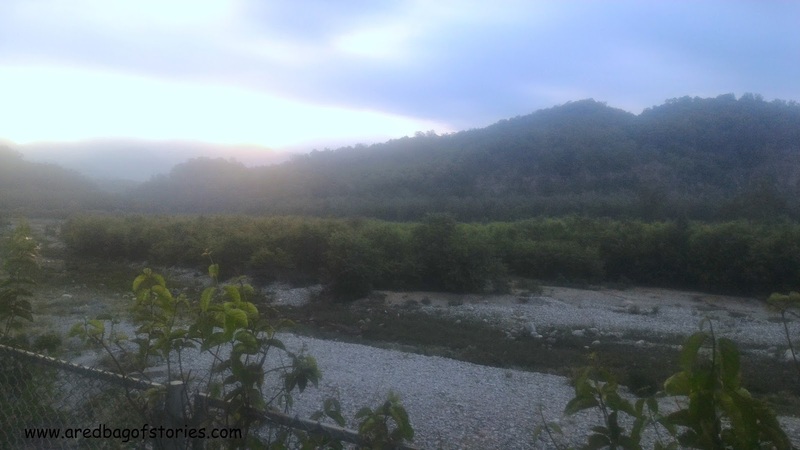 A breathtaking property, beautifully designed, Namah is situated at the banks of Kosi river and is close to the Jim Corbett National Park. Looking at this vast expanse, I was very sure to lose my way to my own room every single time I would venture out and that’s what happened. Every single time I had to ask around for directions to the restaurant or reception or lobby. 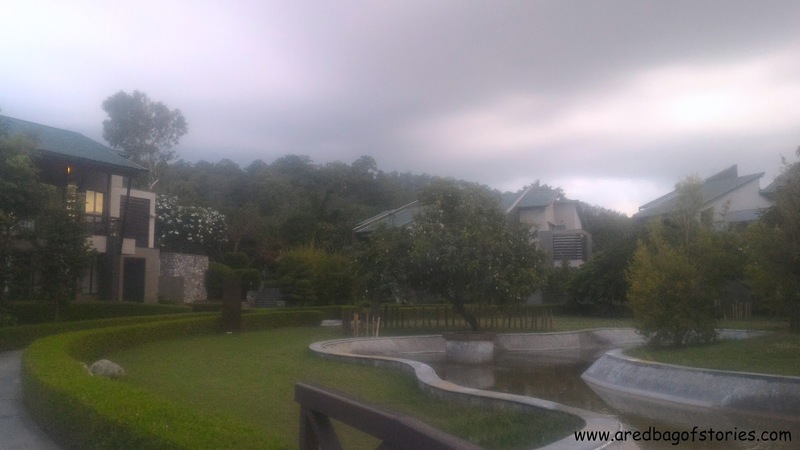 The property is huge and spread across several acres of lush greens and extreme peace. Looking at it, one could know there couldn’t be a better place to have a yoga retreat than this little piece of heaven. After a pleasant pahaadi evening spent amidst some pahaadi music and dance, and a delicious buffet, I was eagerly looking forward to the early morning yoga session. Cut to 5:45am and all of us had to gather in the garden. 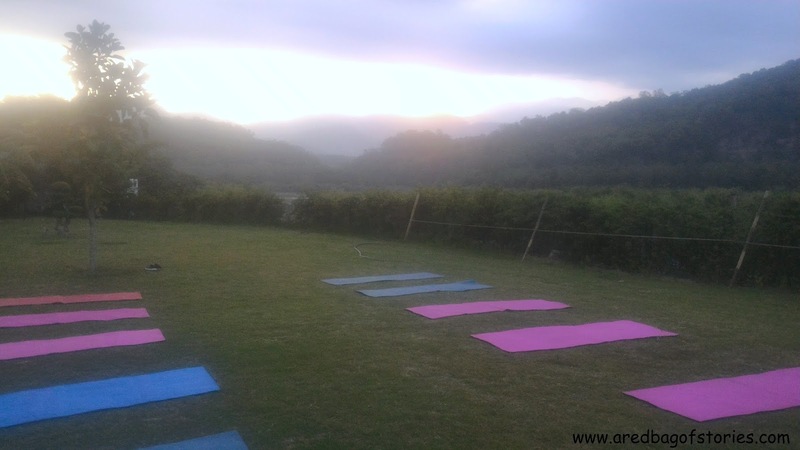 Dressed up for the mat, the morning also looked quite ready to help us kick-start this yoga retreat. A lazy sun still taking time to come out, the little nip in the air, the cool-misty grass, an overcast sky and mountains in the far background, believe me it had to be the most promising morning to go out there, roll the mat and breathe! Getting up to such tranquility! As we reached the assigned spot, the stage was all set with the colorful yoga mats rolled on the grass. The perfect setting for Yoga! Ready to breathe in, breath out. But we were not here to sit and do any asana. We were here to do a yoga practice called jal neti. It is a purification, cleansing technique to clean out sinuses. I had heard about this technique from my mother and when I saw other people doing it, I was pretty sure I won’t be attempting it. And I slowly saw my beautiful yoga dreams breaking in to pieces. 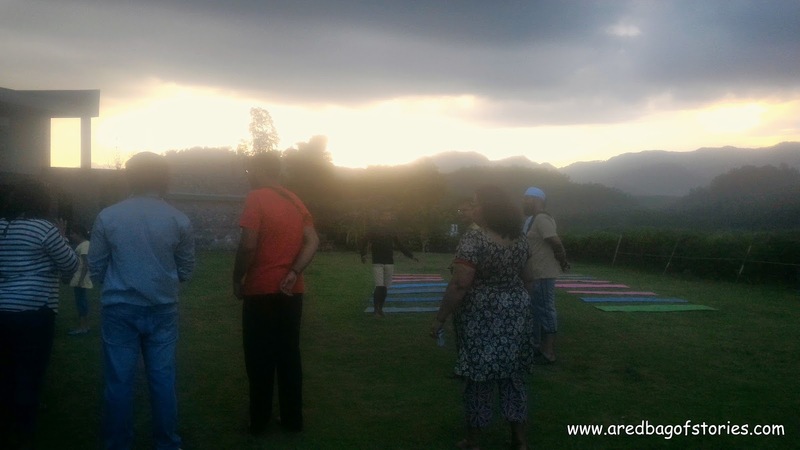 However, the very trained yoga instructors who were accompanying us for the retreat convinced me to try it. I tried and boy, it felt awesome after that! I felt lighter after this one thing and very charged up for the hour long yoga session that awaited us. For the one hour asanas and breathing exercise session, we were ushered in to quiet of the banquet hall. And may I just say, that one hour was sixty minutes of pure bliss. And that buffet breakfast after that felt so worth it. 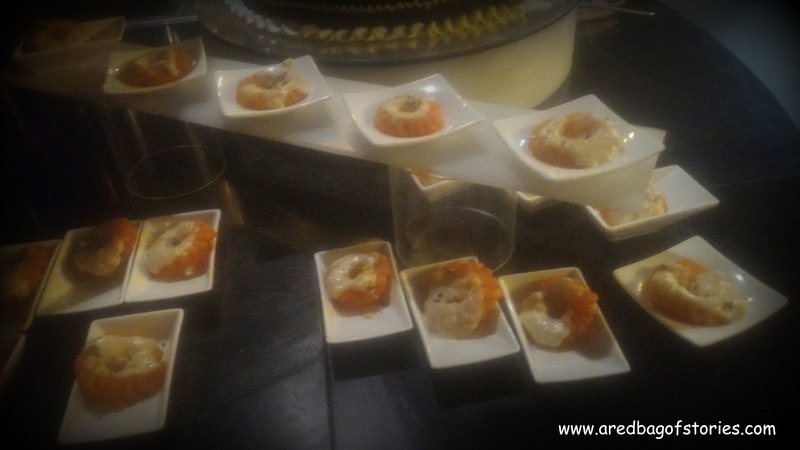 Packed between yoga mornings were lip-smacking buffets with amazing selection of cuisines. Brilliant chef, ably supported by a cordial team made sure we never went out of choice, be it soups, salads, breads, main course and desserts. 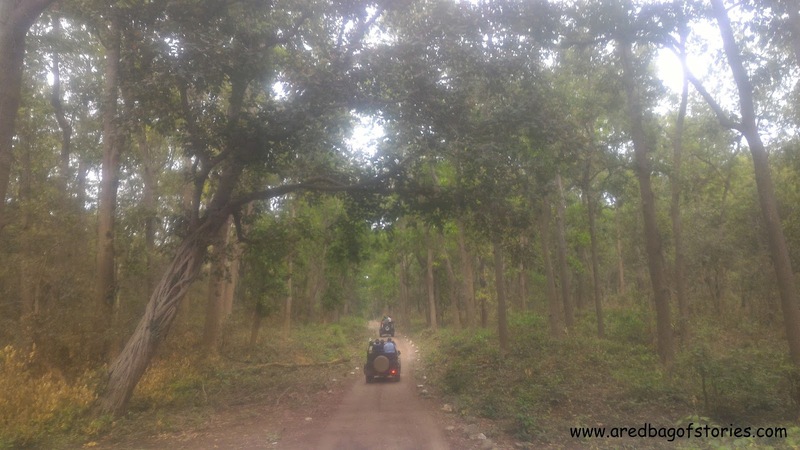 And if this food coma wasn’t enough, we also had a Jim Corbett safari session lined up one afternoon. To be honest, I wanted to slip out of this and chill in the resort, reading a book. 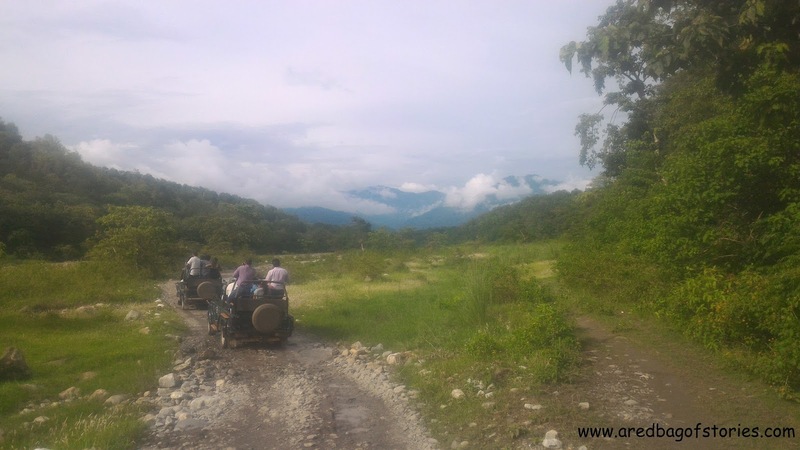 But after everyone told me how exciting it can be, there I was all geared for my first jungle safari ride on a jeep. Honestly, when I was going for this trip, I wasn’t expecting anything except some cool Yoga sessions. I am so glad to have met some interesting people, had some fabulous conversations and spent some quality time with Aditi and Cheeka. 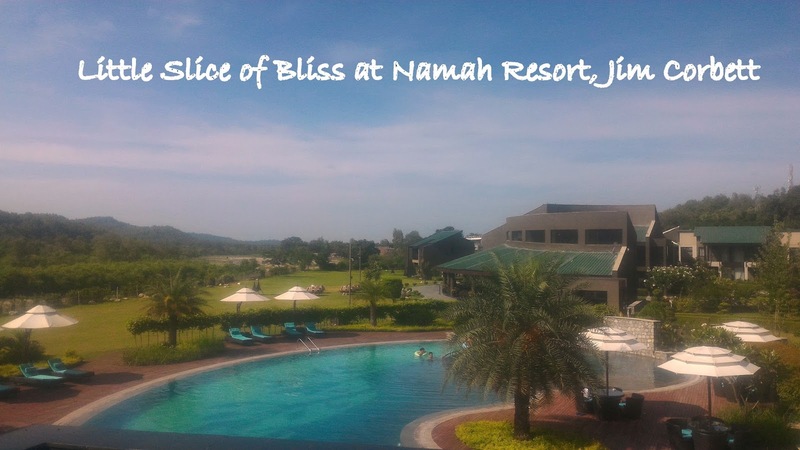 With its location, green cover, great food, spacious rooms and excellent staff, I loved every minute of my time in Namah and given a chance I would take my family there for a relaxed, do-nothing kind of a weekend. 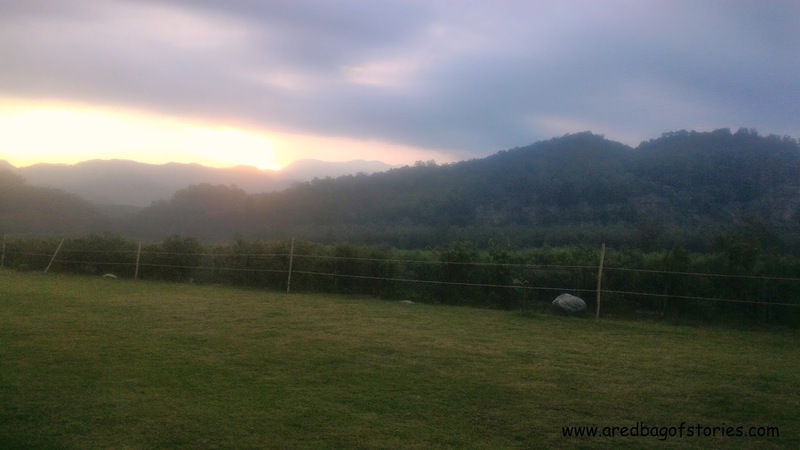 Namah is a great stop for a health and wellness kind of a break in the midst of nature and you can check out more about it here. This Is How I Manage To Travel Often. And So Can You.